Before I even start today’s post I want to emphasise that most important is that you enjoy your child. It is overwhelming to do everything, even if it is your first or only child and you have all the time you could possibly have. I have spent the last three years stressing about the fact that once Daniel had a sibling I wasn’t doing any of this to anywhere near the same level I used to. The truth is, having siblings has been wonderfully rewarding for him and I actually don’t have to be half as intentional about some of the stuff I used to be (like his interactions with other children) because he has a full time playmate at home! And actually, here’s what I wanted to point out, life is not all about outcomes and development. Success happens in many different ways and remember to see your child as just that, your child. Wonderfully made, unique, and a joy to your family! When you have a child with Down Syndrome, one of the major advantages is the diagnosis comes at the start of their life so you can take advantage of “early intervention” – starting therapies early on to encourage their development. If you work in a corporate environment you’ll have come across buzz terms like SMART goals, outcome based goals, processes… well, many of these terms can be used when talking about your child’s development. Today I’m going to look at how we can apply an outcome based approach to child development. Development covers lots of areas – not just the milestones people think of at first like walking or crawling (gross motor) or talking. You could read a tonne of books on child development and if it’s something that interests you, then go ahead. If you just want a central one-stop-shop with a list of milestones, there is a fab resource you can get online called the Early Years Developmental Journal. We found it really helpful in Daniel’s early years to work towards supporting his development and learning. We used it fairly formally on a regular basis (every 9 months or so) – a big sit down and discuss where Daniel was. I’d also look at it in between and jot down any new skills that were emerging. It’s a really meaty document running to over 200 pages with fourteen steps to “achieve”. Naturally, given the learning profile of children with DS, we would find Daniel was on completely different steps for each area of development. At one point he was emerging at Step 11 in personal, social and emotional, but only at Step 7 for communication. So, how can we use this to help our child’s development? When you see a list of stages in child development you can clearly see what step is next (e.g. in gross motor skills, after pulling to stand we’d expect to see them cruising along furniture, then walking with their hands held by adult). Identifying outcomes – or goals – based on what your child is currently doing, what you would like them to be able to do and what steps we expect next will then help form the aims of your therapy sessions. Once we had gone through the EYDJ, we identified steps that were emerging and would set targets around those emerging skills. Some of the goals were simpler. You can see in the photo below that Daniel was showing some thinking around things that go together (like a cup and saucer) and we decided to just buy a toy kitchen to facilitate play that would allow him to match a cup and saucer, put a play pot onto the hob, pour tea from a toy teapot into a teacup, and also assist with pretend play (also an emerging skill). It was nothing more complicated than that as having the toy would then assist the play. We currently have fine motor goals for Daniel that involve increased use of his own cutlery at meal times, and completing the parts of getting dressed that he can do. For his speech therapy we are targeting a specific sound – F – and just concentrating our therapy on that. As part of this process, think about what would be important to your family too. If your child is not yet speaking you may decide to concentrate on signs that involve basic needs – nappy changes, drink, snack, family members – to assist both you and your child with communication and relieve some of the frustrations around that. For us, having Daniel use cutlery and be able to feed himself would make mealtimes much easier for us and give him increased independence. This is why the EYDJ is useful to help you look at detailed steps in development and consider which skills are emerging. There’s no point in using your red book or Birth to Five book the Health Visitor gives you to see what a X year old should be doing and aim for that. Tying shoelaces is something some of Daniel’s peers may be aiming for but that would be a step too far from where he is now, and also is not of much use when all his shoes are Velcro straps anyway. There are times when therapy work is very specific, requiring you to sit down and work with your child. Personally, I only do it well and consistently when I put it on my to-do list like I would laundry or cleaning. Over the summer I am doing Daniel’s speech therapy with him every morning after breakfast when my husband is still at home and I can give Daniel undivided attention. When your child works best – immediately after waking, a few hours after waking, after their afternoon nap. You know them best. It also helps to make appointments with therapists for the best time of day you can. Late afternoon for us is a massive fail and when Daniel was little, the middle of the day meant missing his nap which also didn’t work. When you can give them proper time – if you find mornings hectic, that won’t work for you, but maybe for others the late afternoon slump hits them as hard as the children. You’ve got to be in the right zone as well as your child! 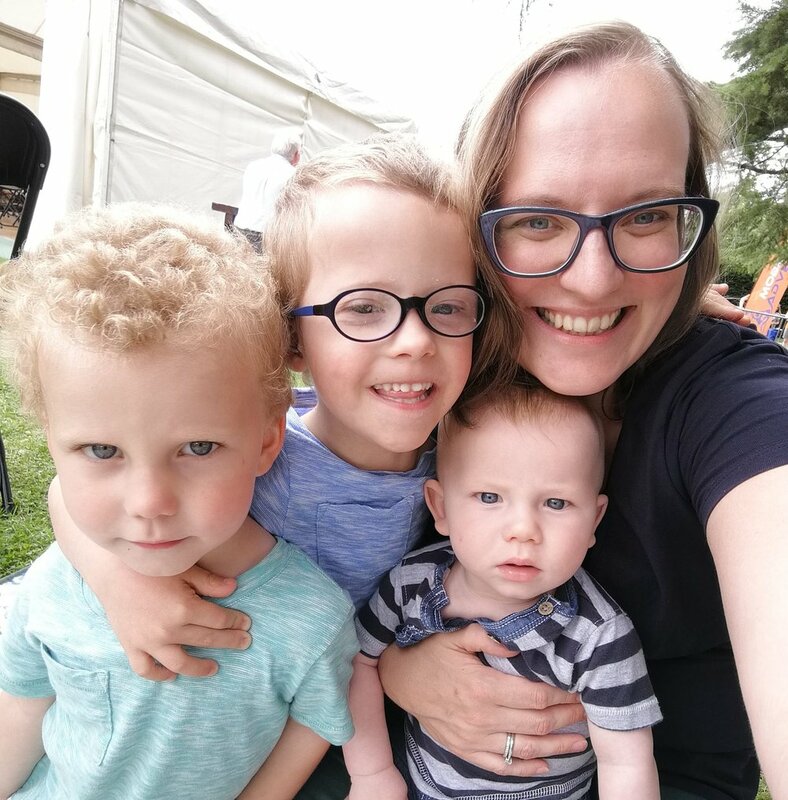 Where your other children are – this is why breakfast time works for us as the other children are happy enough and my husband is still around to make sure they don’t interrupt or disrupt. If your child with special needs is the youngest, then when the others are out at school would probably suit much better! However, not all therapy needs to be formal; there are always opportunities to reinforce learning during the day. Reading books about firemen, lots of F sounds in there – fire man, fire engine, even “Can you find?” questions when looking at the pictures. Having a brother with a name beginning with F helps too (we have successfully transitioned Daniel from baby Bin to baby Finn, thankfully!). Plenty of the gross and fine motor skills can be done in day to day play and life. Getting your child to put the money in the slot in the car park ticket machine, or playing with stacking blocks, or clapping along to music. A positive to early intervention - there are major advantages to having therapists involved in your child’s care. Everyone always says children don’t come with a manual, and you get no training for the most important job you’ll ever do. And yet, since having Daniel I’ve had the opportunity to attend training courses on speech development, Makaton sign language and even a workshop on occupational therapy props. I’ve got people I can phone and ask for advice. I’ve really enjoyed the relationships I’ve made – his physiotherapist was delightful and his speech therapists are people who genuinely adored him. A loving family is more important than any therapy, so if you’re running on low, just love them and the therapy can take a back seat. Don’t let it become the most important thing in your family. Honestly, I was determined that we would work to ensure Daniel’s speech and communication gave him as much opportunity for independence as an adult e.g. being able to have a job because he could communicate effectively with people. It took years before I realised he would never have perfect speech, that a speech problem was going to be part of his whole life, before I could relax a bit and feel much less guilty about ‘failing’. Daniel is blessed to live in a family that adores him, he knows he is loved and is happy and that is the most important thing!